This year’s A to Z Challenge poses a quandary. I’m participating sort of, but there’s a major landscraping or landscaping project involving a gulch, 4 chickens, and a lot of rubber tires. Unfortunately, I can’t hitch the 4 chickens to a plow and make them terrace the side of the gulch. Have you ever harnessed a chicken? I don’t recommend it. It’s worse than trying to walk a cat on a leash. So I am by sweat and toil, like one of those dwarves with Snow White or Middle Earth, terracing the side of a gulch so that I can build a chicken enclosure there, so the chickens can run free within the enclosure and not tear up our neighbor’s driveway, not tear up the other neighbor’s garden, and stop hiding eggs under the house and other secret places. I could save myself a lot of trouble by buying 4 rubber chickens and throwing them over the side of the house and have thought about that more than a few times, but I have a vision of looking down from the deck to see little chicken heads bobbing up and down pecking at the hillside. This project has been going on for months, no, years, and I know a lot about what not to do. On the other hand, the A to Z Challenge has a strong pull every April so I am trying to blog as little as possible while completing this challenge and continuing with the infamous chicken Taj Mahal project. As for the A to Z of Places on Maui, I am resisting the temptation to write about every place on Maui that starts with a letter like K. Almost everything starts with K. Kahului, Kihei, Kula, Kaupo. M is another impossible letter with countless names. The Hawaiian alphabet only has 17 letters, compared to English and K, M and L are really popular letters! So I am choosing just one or two places per letter, trying to capture the essence of the place in a seat-of-the-pants kind of way, without much editing or fussing. I’m hoping to keep up and to reciprocate any comments on my posts, which isn’t the optimal way to do the A to Z Challenge, especially compared to last April, but doing a chicken enclosure on a 40 degree slope isn’t optimal either. This picture is from a friend’s map of Maui. She wrote all sorts of notes on the map which I found wildly entertaining. People who have 4 chickens, a gulch, and a lot of rubber tires are easily amused by all sorts of things. 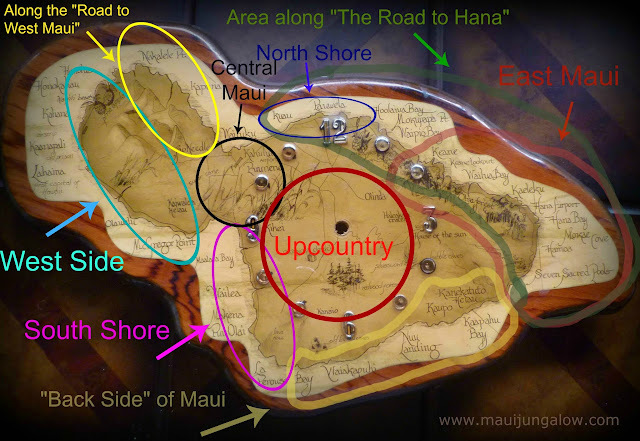 Map of Maui with my notes of different regions on Maui. The markings are approximate, since I'm not a graphic designer. The Maui map is full of contradictions. The “South Shore” really faces west, but to differentiate from the West Side, it’s called the South Shore. The true south side of Maui is NOT called the South Shore, but most people call it the “Back Side of Maui” – it’s very rocky, dry, and undeveloped. The North Shore faces north, but there is another north-facing shore on the West Side of Maui but no one calls that the north shore except tourists. Upcountry is a term that is vague, and may include parts of the North Shore that are not too close to the ocean. East Maui is also vague – where does East Maui start and end? It’s up for debate. Like the map, planning and zoning ordinances are also confusing and contradictory on Maui. An old map of Maui on a clock at my home. I'll be using this clock picture a lot.